Finally I finished building the "Flying Pig Rig" after being in a drawer for years. 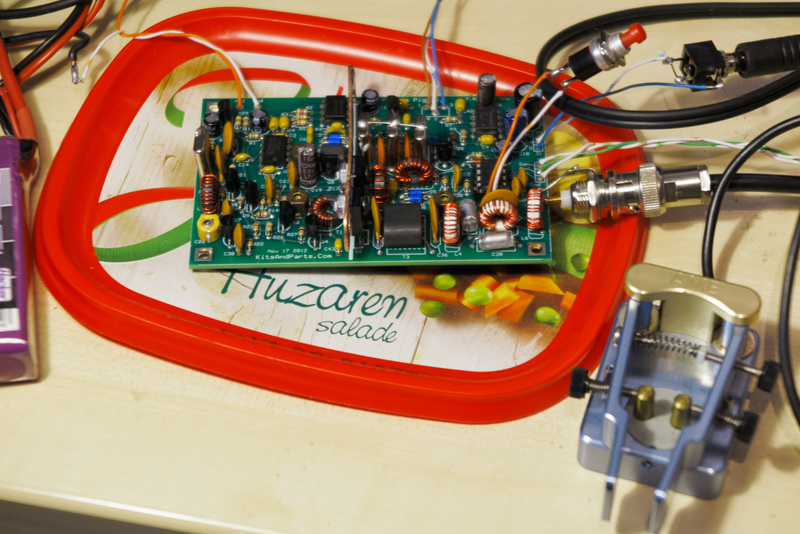 A 40m 5 Watt CW transceiver kit from Kits and Parts dot com! It's a single frequency QRP CW transceiver that will fit into a small box. It is lightweight and very power economic. It receives and transmits on 7030.7 kHz. The Flying Pig Rig has a build in keyer. I will use it with my LiPo batteries. With 12.3 volt the output power is 4 Watts! It draws 25mA on receive and 630mA on transmit. Compare that for example to the Yeasu FT-817nd which will draw 300mA on receive and 1.9A on transmit! I plan to use this QRP rig on some SOTA activations later this year. thanks for call on 7MHz yesturday..
please , what is your equipment you used in our conntact ?? ?